Who invented the Barometer? The name of the person credited with inventing the Mercury Barometer is Evangelista Torricelli (1608 - 1647). Evangelista Torricelli is not only famous as the Italian inventor of the Barometer but also as a noted mathematician and physicist who was the first to discover air pressure. When was the Barometer invented? Evangelista Torricelli invented the Barometer, originally known as the Torricelli's tube, in 1643, during the Renaissance period of inventions (1350 to 1700). Definition of the Barometer: The Barometer is defined as an instrument containing liquid mercury for determining the weight, or pressure, of the atmosphere for judging of the probable changes of weather. A barometer measures atmospheric pressure in units of measurement called atmospheres or bars. Definition of Atmospheric pressure: Atmospheric pressure is the weight of the air at ground level. High pressure is almost always a sign of good or fair weather and low pressure is associated with poor weather, rain and storms. Fact 1: Who invented the Barometer? The mercury Barometer was invented by Evangelista Torricelli in 1643 during the Renaissance era of inventions (1350 to 1700) which was a foremost addition to advancements made in the area of Science. Fact 2: Who invented the Barometer? The device was initially referred to as "Torricelli's tube" and the word 'Barometer' was probably was coined and certainly popularized by English scientist Robert Boyle (1627-1691). The word 'Barometer' derives from Greek word 'baros' meaning "weight" and the Latin word 'metrum' meaning "measure". Fact 3: Who invented the Barometer? Prior to the invention of the Barometer in 1643, weather vanes were used for observing and predicting the weather. A weather vane was a mechanical device consisting of plate metal shaped like an arrow or a rooster, with letters that indicated the points of the compass, which was mounted on the roof of a house or church spire which rotated freely to show the direction of the wind. Fact 4: Who invented the Barometer? The only other indication of weather conditions was by referring to an almanac, a yearly handbook of astronomical information and weather predictions introduced in the 16th century, which gave long range, seasonal forecasts for different areas of the country. Fact 5: Who invented the Barometer? The invention of the mercury barometer measured changes in air pressure to predict short-term changes in the weather. It was important for people such as farmers to be prepared for short term weather changes, so that tasks could be completed or changed and livestock cared for. Such knowledge also kept people safe from safe from hazardous situations. Fact 6: Who invented the Barometer? The inventor of the Barometer, Evangelista Torricelli, was born on 15 October 1608 in Rome, Papal States and died on 25 October 1647. Fact 7: Who invented the Barometer? The early years of Evangelista Torricelli were spent in Rome, Papal States where he was raised by his family. His father was Gaspare Torricelli and his mother was Caterina Angetti. Evangelista Torricelli was well educated and studied science and math under the Benedictine monk Benedetto Castelli at the Collegio della Sapienza of Rome. Fact 8: Who invented the Barometer? Following his education he worked as a secretary and assistant to the great scientist, astronomer and physicist Galileo Galilei for just a few short months before the great man's death. Evangelista Torricelli then went on to assume the position of mathematician, philosopher and instrument maker at the court of Grand Duke Ferdinando II of Tuscany, where he remained all his life. Fact 9: Who invented the Barometer? 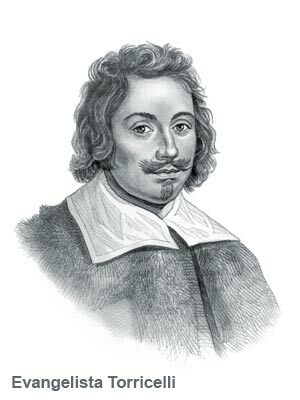 Evangelista Torricelli conducted various scientific experiments and became particularly interested in the science of meteorology that involved the atmospheric conditions and weather of an area. Fact 10: Who invented the Barometer? The invention of the barometer began when Evangelista Torricelli began investigating the working limits of a suction pump and set up experiments to investigate the effects of pressure in a vacuum. Fact 11: Who invented the Barometer? The Renaissance era was a period of great enlightenment when scientists sought to answer questions such as "Does the air have weight?". Most people of the time believed that air was weightless. Evangelista Torricelli devised an experiment which actually proved air had weight and an instrument to measure air pressure. Fact 12: Who invented the Barometer? Evangelista Torricelli first experiment involved water. He set up a a 35 foot tube water experiment, that literally protruded out of the roof of his house, and noticed that air pressure changes, related to changes in the weather, caused the water level in the tube to rise and fall. Fact 13: Who invented the Barometer? He placed a dummy on top of this giant water column, and his neighbors began to see this dummy moving up and down with the changes in the weather. Townsfolk believed he was involved in some sort of sorcery and Evangelista Torricelli quickly realized he needed to be much more discreet in his experiments. Evangelista Torricelli was well aware that his mentor Galileo had been convicted of heresy by the Roman Catholic church - the Renaissance era was a dangerous time to be a scientist. Fact 14: Who invented the Barometer? He changed his experiment deducting that mercury was heavier than water and would require a tube of only 32 inches as opposed his 35 foot water tube. Torricelli discovered that mercury rises and falls when atmospheric pressure changes. The mercury typically hovered between 28 and 30 inches high in the tube, with variations in the height of the mercury based on the air pressure. Fact 15: Who invented the Barometer? Evangelista Torricelli built the first mercury barometer in 1644. The barometer consisted of a liquid mercury filled tube that was closed on one end with a mercury reservoir at the other end. As the air pressure surrounding the barometer increased, the pressure forced the mercury to move up the tube. As the air pressure decreased, the mercury moved back down the tube. On the side of the tube, there were marks that corresponded to measurements in inches that were used to quantify changes in pressure. Fact 16: Who invented the Barometer? Evangelista Torricelli, the inventor of the barometer, died of typhus on 25 October 1647 and was buried at the Basilica of San Lorenzo. The torr, a unit of pressure used in vacuum measurements is named for Evangelista Torricelli, the inventor of the barometer. Fact 17 - The Aneroid Barometer: In 1843, Lucien Vidie modified Evangelista Torricelli’s barometer by inventing the aneroid barometer that did not need mercury or fluids. The aneroid barometer consists of a small, flexible metal box called an aneroid cell which is made from an alloy of beryllium and copper. Who Invented the Barometer? - Evangelista Torricelli - Inventor - Invention - Definition - Meaning - Famous - Important - Barometer History - Timeline - Innovation - Significant - Development - Science - First - Definition - Kids - Barometer Facts - Information - Info - Who invented the Barometer - Dates - When - Why - Impact - Purpose - Use - New - Old - Amazing - Best - Barometer Definition - Meaning - Awesome - Cool - Renaissance - Italian - Barometer History - Timeline - Who Invented the Barometer?